MINNEAPOLIS — Pangea World Theater and Teatro del Pueblo are proud to present the world premiere of “Isla Tuliro,” an imaginative new play written by Marlina Gonzalez. The astute fable will be on stage April 6-22 at the Southern Theater, 1420 S. Washington Ave. in Minneapolis. Isla Tuliro puts an allegorical spin on the effects of colonialism on the evolution of language. The script uses Spanish and English the way Filipinos speak these two colonial languages in contemporary culture…a mash-up of three languages made up of somewhat English, not so Spanish, but always Filipino. In this playful and thought-provoking parable, the idyllic life of the Kayumanggis, brown-skinned islanders who live by Dagat Payapa (Ocean of Peace), is disrupted by the sudden arrival of mythical creatures from the ocean and from the sky who speak strange languages. The intruders claim the islands as their own and make up rules on how the islanders should live. 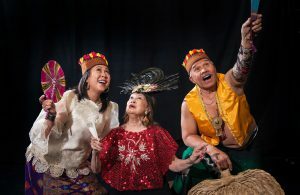 Directed by Pangea World Theater’s Meena Natarajan and Marlina Gonzalez, Isla Tuliro features Lita Malicsi, Mar Alojado, Mary Anne Prado, Ligaya Carlos, Atquetzali Quiroz, Maia Hernandez, Lyra Hernandez, Kaysone Syonesa and the Cultural Society of Filipino Americans (CSFA) Dancers. The creative team features Sandy Agustin (movement), Eric Gonzalez (sound), Theo Gonzalvez (original music), Masanari Kawahara (puppets), Mina Kinukawa (sets), Mike Wangen (lighting) and Jeffrey Stolz (costumes). Tickets to Isla Tuliro are $18 in advance and $22 at the door. Discounts are available for students and seniors. Tickets can be purchased online at Box Office: 1-800-838-3006 and online at islatuliro.brownpapertickets.com. Isla Tuliro is part of the Latino Asian Fusion Series, a collaboration between Pangea World Theater and Teatro del Pueblo. The plays and associated events highlight the intersections, relationships and influences between Latino and Asian cultures. The community producer is Cultural Society of Filipino Americans (CSFA) and also funded by the Joyce Foundation and the Asian Pacific Endowment of the St. Paul Foundation. Additional community partners include Fil-Minnesotan Association (FMA), Filipinx for Immigrant Rights and Racial Justice in Minnesota (FIRM), Filipino American Women’s Network (FAWN), and Philippine Study Group of MN (PSGM).